Last week at Green Valley Country Club I was down by one stroke playing a Stableford match against two visiting golfers with one hole to go. Then on the 18th after hitting a nice drive, I found myself short of the green due to a slightly fat long iron shot. For certain I was going to loose the round as one of my opponents was on in two, an assured of a par, or worse case bogey. Well I thought about what club to hit, and after seeing the short cut fringe and green sloping towards me from back to front, I opted for an 8 iron and attempted to run the ball up the slope. Wouldn’t one of life’s finest moments come when my pitch shot went up the slope and right into the hole for a birdie (net eagle) thus clinching the match as well. Afterward reflecting on my achievement over a few cold ones, I credit my club choice for this success. We all discussed how golf in Thailand has many different situations and lies around the greens and correct club selection is one key to a great score. Ideally, you want to choose a club based on how far the ball will roll on the green, and then let the club’s loft do the work. The idea is to let the ball run to the hole like a putt. I find the clubs of choice in Thailand for this shot are the 7, 8, 9, PW, AW, and SW.
Before choosing the club, consider the fringe condition and green’s speed. Once you selected the club, aim for a flat spot on either the green or the fringe, and let the ball run to the hole. In general, the higher the club’s loft, the shorter the roll will be. The farther you’re away from the pin, the more roll you need. I like to use a less lofted club with an uphill lie while using a more lofted club on a downhill slope. A good drill for chipping it close is getting out to the course 30 minutes before your round and hitting chip shots at the practice green with different clubs from various distances. This drill helps me get a feel for the roll I can expect with each club, at each course and on the particular play day. 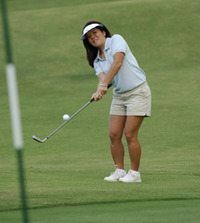 Most all Thailand golf courses have practice facilities, but if you are unsure a knowledgeable local agent such as my golf travel company will always be able to provide such information. Keep practicing until you have a good feel for each club’s roll. Once you do, you’ll find that you will be able to chip the ball closer to the pin, cutting strokes from your score, saving pars, having more birdie putt chances, and most of all making your Thailand golf holiday that much more enjoyable.